Hamilton Laboratories is an independent software vendor (ISV) selling tools to professional software developers since 1988. We are the developer and publisher of Hamilton C shell, a complete recreation of the Unix C shell and utilities for Windows with numerous enhancements. It comes with all the important utilities including mv, cp, rm, more, grep, fgrep, head, tail, diff, sed, cron, tar, etc. 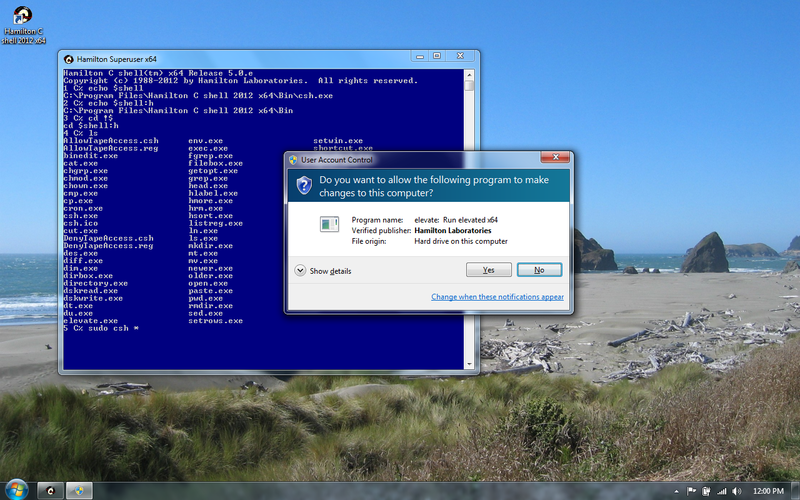 There’s even a real chown, a real su (super user) and a real sudo and they all work under Windows 7 and 8. Hamilton C shell is the fastest, most powerful, highest quality Unix shell for Windows. Period. Since Windows began. Completely bulletproof. Will not crash, will not hang. Ever. Everything always works. Or we fix it. Runs on any 32 or 64-bit version of Windows ever made. 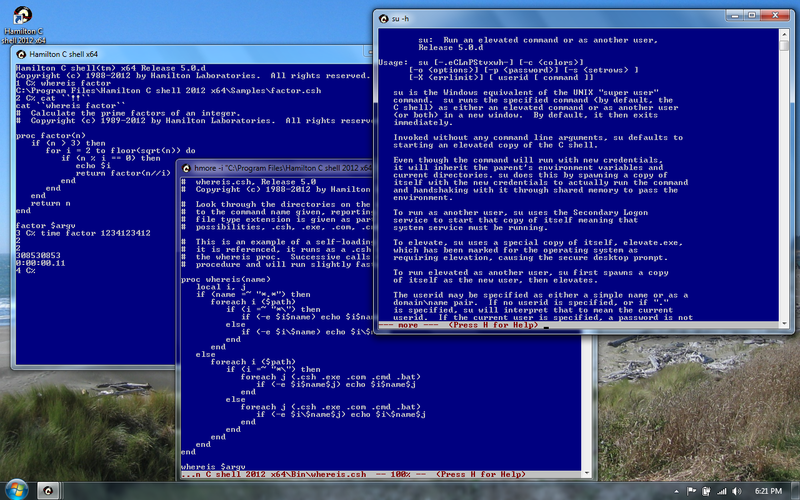 Still the only Unix shell for Windows written from scratch for Windows, not just ported. Still the only one that’s multithreaded. Still the only one that understands simple things like drive letters, filenames with spaces and either slash. Still the fastest. Still the best. Yes. Really. And under our All My Devices™ license, if it's for personal use, you can buy one license and install it on all your personal devices. Cost is no longer an excuse for suffering with poor quality tools, even if they are free and you get the source so you can fix bugs yourself. This site can also accessed securely using HTTPS. Entire site copyright © 2012-2014 Hamilton Laboratories. 64-bit Hamilton C shell 2012 on 64-bit Windows 7 Ultimate. A genuine 64-bit sudo command on Windows 7 Ultimate that knows how to pass a long argument list and the current directories.